Elmer Gantry's Velvet Opera picked up on the British psychedelic movement after supporting The Pink Floyd as a soul/blues band called 'The Five Proud Walkers', the lineup was Richard Hudson (Hud) on drums, Colin Forster on lead guitar, Jimmy Horrocks (Horovitz) on organ and flute, John ???? (bass) and Dave Terry on vocals and harmonica. The boys took inspiration from the experience and it wasn't long before the change of both music and image. They gigged for a while playing blues based material,but gradually got interested in more free-form stuff. John ???? was replaced by John Ford and the band searched for a new name. Velvet Opera was chosen initially, which was amended to Elmer Gantry's Velvet Opera within days after Dave turned up to a session wearing a long black cape and a preachers hat and had to endure some piss-taking from the rest of the band (Elmer Gantry was the fictional hero of a Sinclair Lewis novel and 1960 film about a preacher). The name stuck and Dave became Elmer. By this time Elmer, influenced by the music of John Cage, was making experimental taped backing sounds and using signal generators on stage in the act. The band began to get quite a following and played clubs and university gigs all over the country and at London venues like the Marquee and 100 club and Electric garden. They would also occasionally play at the Speakeasy where Jimi Hendrix would jam with them, also people like Jeff beck and Eric Burdon. The band had been recorded independantly for a while by Southern Music Publishing, who had their own, four -track, studio in Denmark Street, and it wasn't long before they had secured a record deal with CBS's "Direction" label. The problem was that Southern Music had originally signed them as a bluesy/jazzy band and they were not very keen on trying to get new, more riotous stage act on disc. The group were persuaded to do more "regular" material. The first recording was the song, written by Elmer, that the band were best known for, 'Flames'. The record was on jukeboxes all over the country and was covered live by bands as diverse as "The Joe Loss Orchestra" and "Led Zeppelin", in fact Jimmy Page recently told Elmer that Flames was the only non-Zep number that they included in their early stage-act (Robert Plant also included it in his 2001-2002 tour). However, for the average radio listener the song was too far ahead of its time and despite live popularity and numerous radio plays the song only managed to achieve number 30 in the charts. Direction did however, take faith in the band to record second and third singles and more importantly a self-titled album. The group's second single, "Mary Jane" was taken off the BBC playlist after they realised that the song was the slang term for Marijuana. The third single, Volcano, was written by Howard & Blakely, who had written hits for Dave Dee etc. After three singles and the album, major success had still not been achieved. The agent at the time, Terry King, had booked the group a lot of shows, they were regularly appearing on the BBC on John Peel's show, among others, they were playing, touring and promoting hard, but recording success was still elusive. Colin Forster was then replaced by Paul Brett but this still didn't acheive the desired result. Disagreements erupted within the band, which lead to a split from Elmer and so the Velvet Opera was formed. Elmer Gantry remembers : "eventually, EGVO broke up due to a change of direction within the band. Paul Brett, (who incidentally I had worked with previously and had brought into the band following our initial success) although a brilliant guitarist, had a strong interest in more folkish music and, with Hud's increasing interest in playing instruments other than drums, the band started to change direction. I did not welcome this change, and whilst I had great admiration for all the other members as musicians, was not interested. There followed a coup in which the other members of the band attempted to just replace me and keep the name. This would clearly have been ridiculous as I was already known as Elmer Gantry and the band was largely know for its riotous, envelope-pushing stage presence, not for electro-folk. 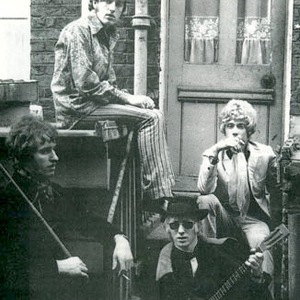 The result was that they brought twelve string guitarist folk-blues guitarist Johnny Joyce in, and continued as The Velvet Opera and eventually The Strawbs and The Monks producing the novelty hits "Union Man" and "Nice legs, shame about the face" and I continued with a new line-up, formed from the Downliners sect, as the Elmer Gantry band. I also later had a lead role in "Hair" in the west end, recorded on two Alan Parsons Project albums, did the lead vocals on Cozy powell's album, sang and wrote with Jon Lord on his solo album. A second album, "Ride a Hustler's Dream" was released by the Velvet Opera on their own, Elmer and Colin having been replaced by John Joyce and Paul Brett. The album was recorded (as was the EGVO album) at Southern Music's studios in Denmark St. Paul Brett remembers : "It was an 8 track set up and was a real struggle to get real quality and instrument separation, but we did our best. We did lots of Radio 1 sessions and quite a few dates, the most memorable being with the Who at The Lyceum. John Ford and Richard Hudson were getting more into writing their own songs and they also wanted to perform them, Johnny and I were more into acoustic music and inevitably, we went our own ways quite amicably. Southern would have made another LP with us but we felt we needed to follow our hearts! I spoke to Hud last year about the possibility of collaborating on a new Velvet Opera LP as the bands reputation has survived and even grown over the years, probably because we have all done our own things. This is very much a possibility and I will pursue this with Hud and John. I did a CD last year with John Joyce 'Acoustic Power' that was really well received by the media. It could also be that there is another Fire LP in the future and certainly their will be more Paul Brett CD's and there are collectors issues on CD of the previous material and some unreleased Paul Brett & Sage stuff via my site www.fret-dancer.com". After the split, Ford and Hudson joined The Strawbs whilst Rick Wakeman was still a member. In 1971, Colin Forster recruited a whole new Velvet Opera featuring ex-Tintern Abbey vocalist, Dave MacTavish, bass player Colin Bass and drummer Mike Fincher who recorded one single on the Spark label. Elmer Gantry later appeared in the Seventies in Stretch singing the hit single "Why Did You Do It?" Stretch released four albums and some singles on the "Anchor" label. During the 90s, a CD of live "John Peel BBC Sessions" was released by "Strange Fruit" and a double CD set " Stretch, The Story of Elmer Gantry" was released on Repertoire Records. The Stretch catalogue is currently handled by "Trojan Records." Elmer is now working in the drug-rehabilitation field but still gigs occasionally both here and in America.